The dollar-yen pair has been bid notably in previous days and it jumped to the 109 level on Tuesday, trading 0.15% stronger during the London session. Yesterday’s US PMIs came out above expectations and confirmed the strong economic momentum in the US. The manufacturing sector accelerated from 55.6 to 56.5, while the services index rose from 54.0 to 54.4. These results supported the US Dollar across the board. Later in the day, the consumer confidence gauge is forecast to slow slightly from 127.7 to 126.0, but new home sales are expected to rise from 618,000 to 625,000. Volatility could be elevated afterwards. Yields in US continue to rise, with the 10 year touching the 3% mark on Monday, while the 30 year yield rising above 3.15%. Both corrected slightly lower since then. The 2% year yield is still trading around 2.5% and the yield curve flattened on Tuesday. The USDJPY pair managed to climb beyond 108.50, which was a critical resistance. While it remains beyond, the outlook could be bullish, targeting the 100 day moving average at 109.00. If broken, further rise toward the psychological level of 110 could occur. 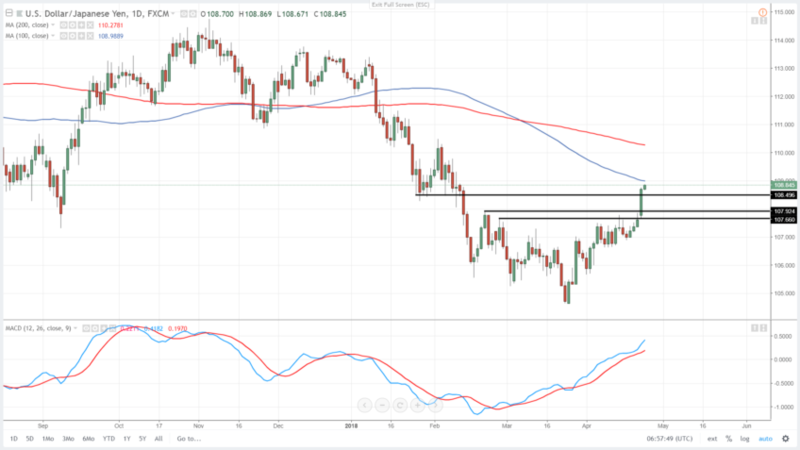 On the downside, supports are seen at 108.50 and if not held, the greenback might decelerate to 108.00 or eventually to 107.60, where previous highs are located. In all cases we strongly recommend to have rigorous money and risk management.